Tired of scrolling? Download a PDF version of our 2018 ecommerce platform comparison for easier offline reading and sharing with coworkers. What an ecommerce platform is. What your options are (hint: Open Source, SaaS, CaaS). What the heck cloud even means these days (hint: it’s just where your hosting environment is). How an ecommerce platform can benefit your business. Important questions to ask your ecommerce platform solutions in your consideration set. An advantage and disadvantages breakdown of the most popular platform options. Additional FAQs in case we forgot anything. Because on average, open-source ecommerce platforms and sites have a 6x annual cost of ownership versus SaaS or CaaS models. Internet Retailer’s 2018 survey found BigCommerce to be the #1 SaaS ecommerce platform preferred by mid-market and enterprise retailers. Learn more by downloading their report. WooCommerce disadvantages include scalability without slowing down the live store and the high developer costs associated with most open source platforms. Here is more information about the history of WordPress ecommerce. Shopify advantages include a quick learning curve for non-experienced ecommerce practitioners, resulting in a quick go-to-market for new brands. They also have an enterprise solution called Shopify Plus. According to Internet Retailer, BigCommerce and Shopify are the two fastest-growing platforms serving B2B and B2C sites selling more than $1 million per year online — but BigCommerce outranks Shopify in both adoption and growth rate. Read more to see BigCommerce and Shopify compare. You can read a detailed post on the troubles here. 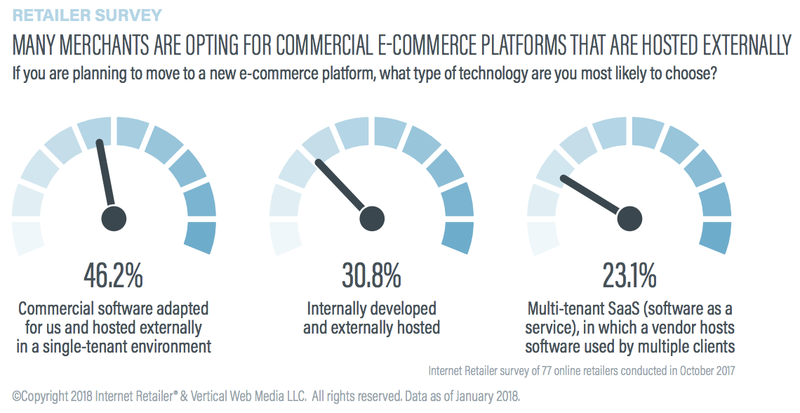 Most ecommerce startups used an ecommerce platform – particularly a SaaS solution. More flexibility, faster go to market. See what Open SaaS can do for you.